The Asoka pillar is one of the most famous places in Sarnath. The monument is of great importance for the Buddhist community as it marks the place of Buddha's first sermon. The monument is also called the Sarnath pillar and used to50 mts. tall. 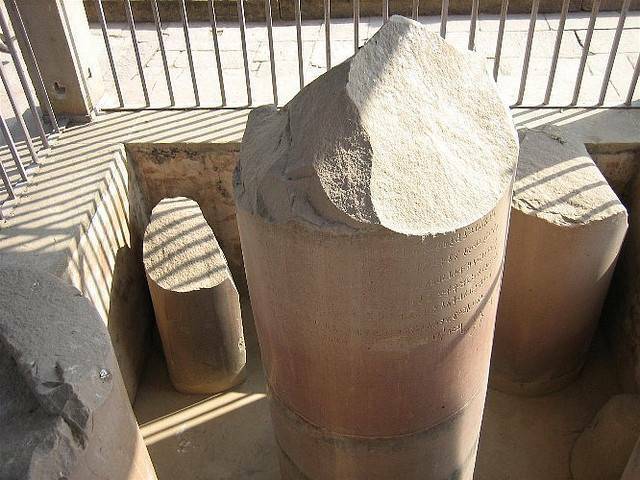 The pillar is not present at its original location now as it was destroyed during Turk and Islamic invasions. The Lion capital (also the national emblem of Govt. of India) is placed at archeological museum at Sarnath. The pillar depicts four lions on the top of the monument in standing posture. At the bottom, you can see the famous Asoka Chakra. The top of the monument you can see a frieze supporting the images of an elephant, a galloping horse, a bull, and a lion. The pillar is made out of a monolithic sandstone rock. The monument gives you a feel of its past grandeur.